Good Morning! I hope your weekend went well. Mine wasn't as productive as I'd hoped it would be. Saturday morning I ended up sleeping in so late and I never do this. It renders me absolutely useless. I can't get the energy to do anything else. Then I had picked up an iced coffee later and it proceded to make me sick to my stomach - so not a good day. Anyway, some of my readers usually see two posts on a Monday for me. I stepped down from the Love to Create design team. Although I love Jackie very much and am so happy that her challenge blog is wildly successful it's just too much for me. So here's my one post for Monday.... Paper Pretties. This week we're making shaped cards. 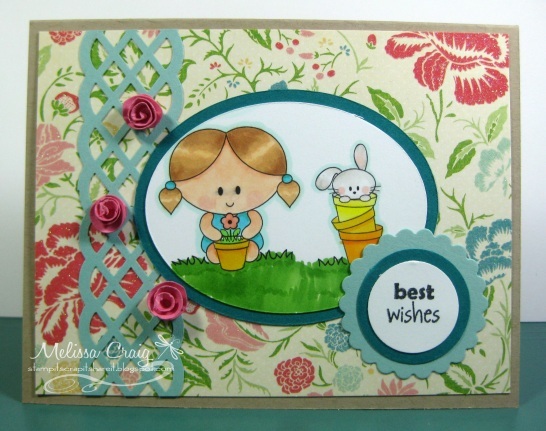 So here's my flower card with the new cute image Buttercup by ARTish. I created this with SCAL and my Cricut. Yes, it still works for me. I'll never update the hardware on the Cricut so that SCAL will still work with it. That is until I can get rid of it and get a Black Cat or whatever it's called. I hope to see you play along with us! Good Morning! How are all of you doing? Good! I'm well, too. Thanks for coming by to visit me for the Delightful Challenges and this week we're paper piecing. I know there are some oops'es on my cards, but overall I'm pretty pleased with how it came out. I kept fairly CAS and found the sketch on Mojo Monday to be perfect. Good Morning! I hope everyone is doing well. It's mid-week already, so that's a plus. I think I know why blogger has been acting funny lately - their new look in creating blog posts is now launched.... I don't like it. I don't mind change, but I didn't find this new way very friendly. I love how the card turned out. And yes, it's another yellow card. This time I'm playing along with The Pink Elephant's color challenge - Yellow and the sketch is from There She Goes. 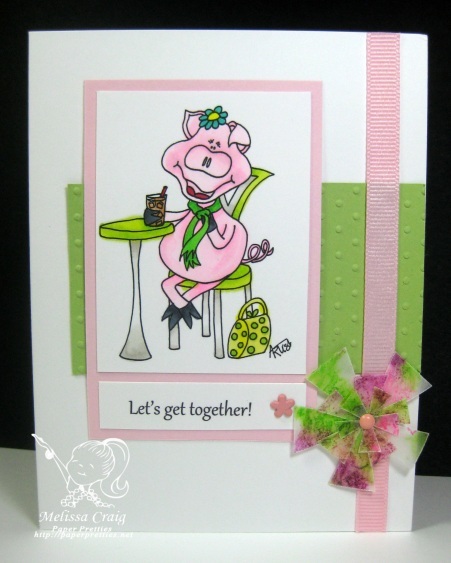 Well, this was just a quick post to share a happy card with you. I hope you enjoy it and I hope it inspires you to check out a new favorite for me - Raisin Boat. Hello!! Welcome to my favorite day of the week. 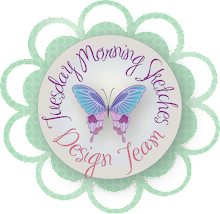 It's Tuesday and we have a great sketch by Kathy and Sassy Studio Designs is our sponsor so you know we're having a lot of fun! Isn't this adorable?! I think she's just too cute and I love love love this color combo. When I was a kid, yellow was my favorite color and it still makes me happy! And because the color makes me feel so happy I was thrilled to get to play along with CMC color challenge this week - Yellow! Hi there! Thanks for coming back. This week at Paper Pretties Monday we've got a color challenge. We're playing with Pink & Green. I also combined this with Sunday Sketch & Stamp who is celebrating their birthday, so you get to pick a sketch to play with. I also added my monthly card traders group challenge, too. This is a crayon technique that I probably will never do again. Do you see the flower? Well, that's shavings from 3 different crayons in between two sheets of wax paper and then ironed. My opinion... what a mess! Anyway, then I used some dies to create the flower. Hi everyone! I am enjoying my mini-vacation. I cleaned my apartment all day yesterday, it felt so good!! I know, did I just say that about cleaning? I hate cleaning, but I was tired of mess, my children too often use our home as a dumping ground and I got tired of hearing my own voice saying "pick that up.... put that away.... why couldn't you just put that in dishwasher..." I'm sure you can relate. Well, I just couldn't take anymore, so I cleaned from top to bottom and it felt really good. Now I can spend the rest of the weekend playing. I'm sorry the picture is so bad. I don't like taking pictures during the day - there are so many shadows to deal with! But I really wanted to play along with some challenges. It's so rare that I get to play with some of these challenges. 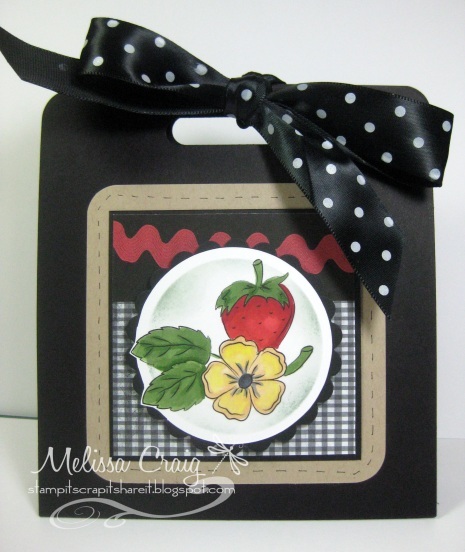 So I used the sketch from CASual Fridays, the colors from Color Throwdown and I used my one of favorite stamp company's stamps, CC Designs, and All That Scraps Wednesday challenge doing an Anything Goes challenge. Why I like their Anything Goes, is it still has some specifics so one can't just fit. I am there on purpose! Speaking of challenges, we only have a few players so far at Tuesday Morning Sketches and great prize up for grabs! Come play along. Hi everyone, thanks for coming back. Please scroll down for the MTME Pretty Pattern #57 post, too. This week at Digital Delights we have a sketch to play with! It is very fun. Here's the card I created with it. Isn't that dragon cute? I love him - his name is Augustus. I love the colors, they are so bright and happy. This was a fun card to put together. Good Morning! How are you all doing? I am sooo excited, I am off work the next couple of days and I am going to take this time to just decompress. I'm going to treat myself to sushi on Friday... mmm. Can't wait! Well, the new Pretty Pattern #57 is up and ready for your enjoyment. Here's my card that I made with this amazing sketch. My card features some fabulous stamps from the Petal Perfection stamp set and another wonderful digi paper pattern - love Fun Fronds! Good Morning! I am soooo excited about today. It's Tuesday so that, of course, means a new sketch at Tuesday Morning Sketches but I am more excited about our sponsor this week. 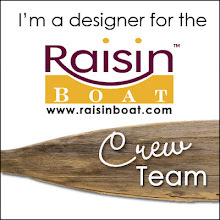 We have Kim and Bobbi of Raisin Boat sponsoring us this week. I have mentioned them before, but let me share with you how much I love this company! Raisin Boat is, how I describe, the Netflix of the stamping world. You rent stamps! You receive a minimum of 2 stamp sets per month and you get to play and create with them that whole month and then send them back (postage paid round trip!) and get two new sets to play with (when eligible per plan). And if you decided YOU SIMPLY CANNOT part with a set, then it's available for purchase at a member discount. But not only do they have LOTS of stamps to choose from, also available is card stock is super yummy colors, Stickles and other embellishment options, ink and Copics! This is such a wonderful place to shop. This card was made entirely out of one stamp set called Curly Cute. And then Kim & Bobbi were generous and sent us stamp sets to play with and keep. This set is up part of the prize package being offered. And... ahem... bottom line - it's fabulous!! And for those who know me - this sentiment is totally me! I talk like that. LOL And this card features their FAN. TAS. TIC!! card stock. I love it, the colors are rich and vibrant. The texture is smooth and the weight is perfect. I know I sounded like a big commercial and I'm not trying to sell you anything - I am just very excited about this company and their products. I hope to build a strong relationship between RB and TMS and me, too! If you'd like to try their products for free, then just play along with us for a chance to win. Hello everyone - thanks for coming back! This week at Paper Pretties we're embossing. 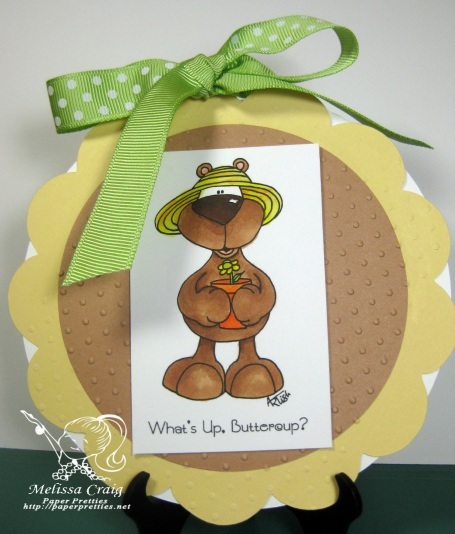 What an easy challenge since we all have fabulous embossing folders to play with. This little poodle knows how to treat herself! 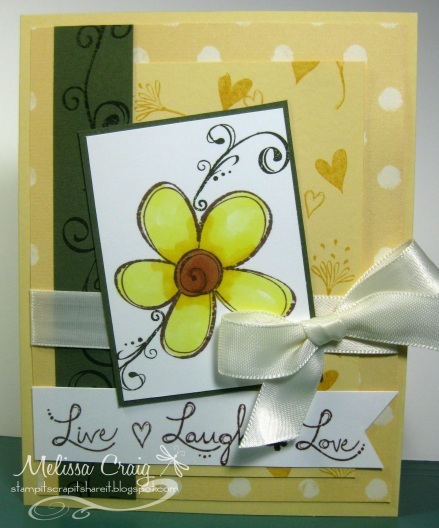 I created my card using a fabulous sketch from Unscripted Sketches. Hello Friends. I hope you all had a great weekend. I was sick most of the weekend - I got hit with a headache Saturday morning that made me sick to my stomach. Not a way I wanted to spend the weekend. I still managed to push through it and got some cards done, did my shopping but didn't clean - so nobody surprise me with a visit, OK? This week's challenge at Love to Create is about friendships. One of life's most important relationships. So this is the card I created to celebrate that relationship. We do have a sketch to play with, too, it's optional but I urge you to use it - you'll love it. 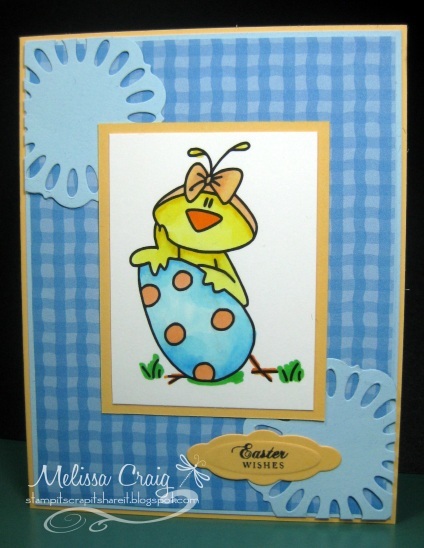 This card features a Molly calendar image which are some of my favorite images! I have a couple of others, I would love them all. 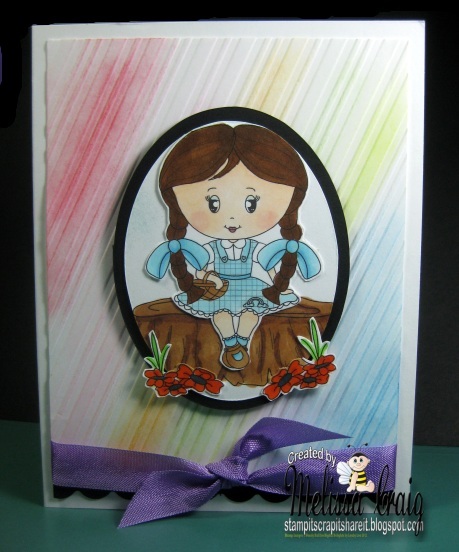 Stamp Fairy images are so wonderful, Gerda draws the sweetest images. Have you caught the excitement that has been brewing over at Soft Pencil. I actually was really bad - I completely forgot to post the little picture in my sidebar to share with you about the blog hop. But I hope I am redeemed this week. If you arrived here from Monica's blog, you're on the right track. If not, go to Soft Pencil's blog for a complete list of blog hoppers. We´ll also celebrate I´ve just opened my own shop where all my products will be available: digi-stamps (yes, they´re back! ), clear stamps, stickers, rub-ons, kits for card making, scrapbooking and paper crafting (they´ll be available on the upcoming weeks) and many more products coming soon! I want to thank a lot to every of the blogs that are participating, thank you so much!!! they´re 50 so we had to organize 3 different blog hops. As you see on the image the first one will run from April 10 to April 15, the second one will run from April 15 to 20 and the third one, from April 20 to 25. And there will be many prizes to hop on each one! I chose the Growing Flowers in Pots image. I just love the bunny peeking out of the pots. So sweet! I also wanted to carry that garden theme throughout, so I tried to create a trellis, but I didn't have the right leaves punch, but I still am please with the results. I did get a little help from my friend Joni's blog - Raise the Bar. 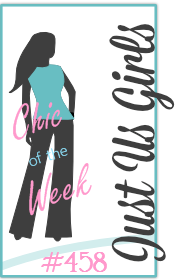 There is a great and super easy sketch on her blog this week. Thank you for stopping by and enjoy the rest of the hop. The next stop is Carole's blog. Good Morning!! OK I was having computer/internet issues. Aggravating! But I'm here now with my Pretty Patterns #56 post. 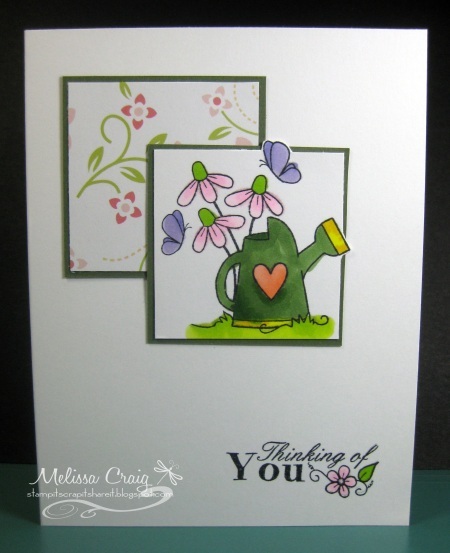 We have a lovely sketch and I am so pleased with my card that I created with it. 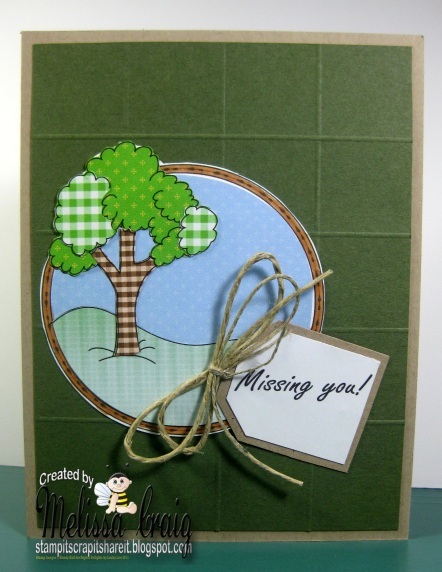 I used my favorite digi stamp set Bee Loved (I'm definitely ordering this one in stamp form! )﻿ and beautiful digi papers. I sponged Antique Linen distress ink on the edges just to give it a bit of aging. I love the results. Hi there - thanks for coming back and being so patient with me. I used Bumblebee Larry and some fabulous Echo Park paper. I will sharpen up my post with some other details when I get home tonight, please forgive me. I know the layout is from The Sweet Stop. I'm using a favorite sketch SSS111. I did have to drop the sentiment a bit lower than on the sketch, but I'm still happy with my results. Good Morning! Happy Tuesday! I am so happy to be back this week - the swelling is better and I've learned that I really have to stop dehydrating myself so badly. It's so hard to drink water all day and be tied to a phone. I have to figure out my balance. Well, let's talk about Tuesday Morning Sketches. This week we're sponsored by Digital Delights - a company near and dear to my heart. * giggle * We have a fun sketch... by me. And it's the Judged Challenge week so we've got an added twist. Think Spring! I wasn't sure how I felt about this card when I finished it, but the more I look at the more I like it. 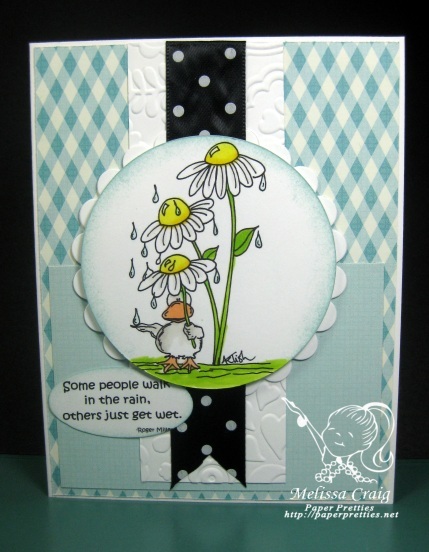 It's so cute and I like the scene I created with rubber stamps from MTME. 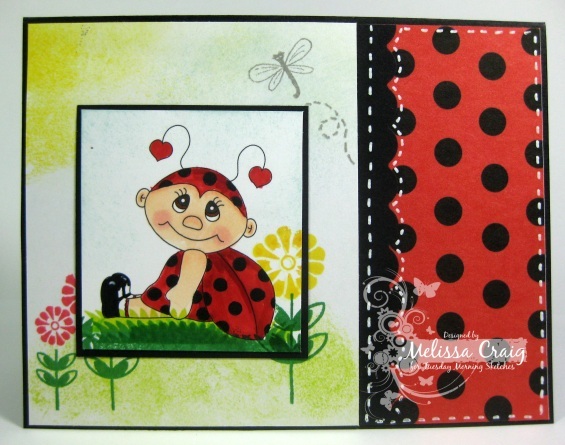 Lara the Ladybug is one of my favorite characters from Digital Delights and epitomizes Spring. Hi! Thanks for coming back. 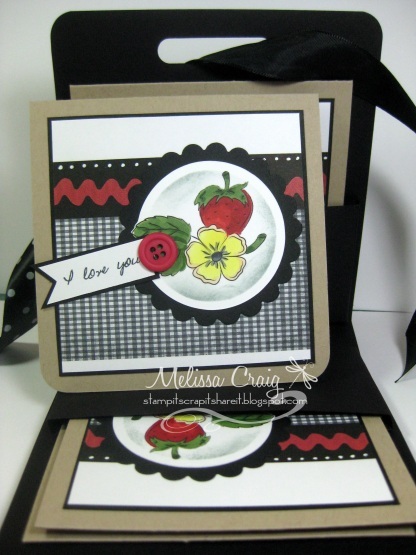 Be sure to scroll down to see my card for my Love to Create post. Here's the 2nd card I got done on Friday night. I really did have a lot of fun - I wasn't tired and I really energized to work on cards. This week at Paper Pretties we're creating with Lots of Layers. This is an easy challenge since most of use lots of layers in our cards anyway. 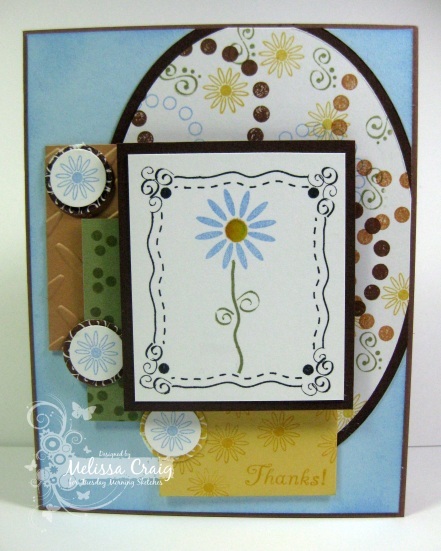 From the base I have about 8 layers to this little card. 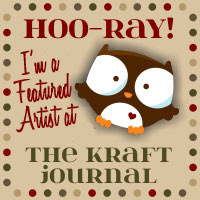 I am featuring the super sweet image from ARTish called Along for the Ride. I created this card using a fun sketch from Guylou's Imitability. Loved this sketch! It was the perfect inspiration for this card. I do hope my card is an inspiration to you! Enjoy your Monday. Unfortunately I deleted my sticky note from my computer where I store my supplies list. Sorry, I don't remember the colors that I used in Copics, the dp is Echo Park, the sun is from a QuicKutz die and I also used my Cuttlebug and Blooms & Dots embossing folder. Good Morning! I hope you all had a great weekend. I did - it was crafty, it was spent with my daughter and the weather was wonderful! Friday nights I usually am just too tired to play at my craft table, but this Friday night I played at my table because my afternoon was scheduled for my daughter's birthday beauty day. So I actually got two of my cards done. The first one I got done is this one for Love to Create. 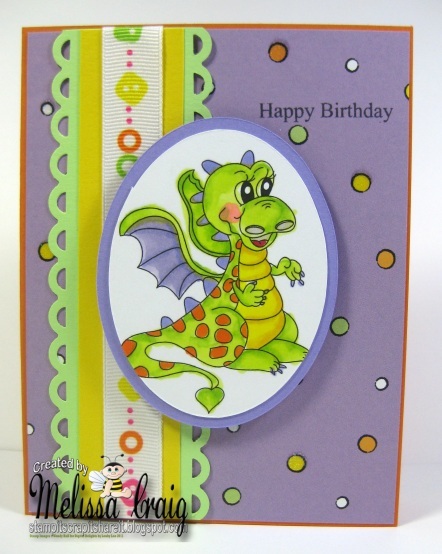 This week we're sponsored by Sassy Design Studio and we're making birthday cards. I love how my card turned out! My oldest son said I colored her perfectly - he said for a "cartoon, she's hot!" LOL I really had a lot of coloring her and really enjoyed getting this card put together. I picked up black & white digi paper pack for free awhile back. Here's what's cool about this. You can print it onto any color paper that will go thru your printer. I printed the diamond paper onto Bazzil card stock and I LOVE the results. Then I printed the dots on white card stock and then drew a box over an area to have a plain spot to stamp my sentiment. My card is created using a grrreat sketch from The DeConstructed Sketch. For the scalloped element for the sketch, I added a metallic wired edged ribbon. I hope you like this and it inspires you to play along. Hi there. Thanks for coming back. We have a really Pretty Pattern (#55) this week at My Time Made Easy. There is also a very Pretty Palette, too. I played along with that challenge, too. 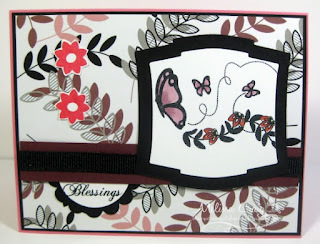 I am featuring another one of the stamp sets that I splurged on - this one is called Sensational Stems. 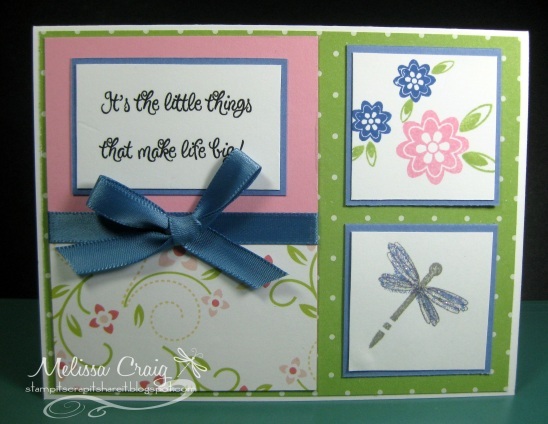 The sentiment is from All A Flutter and the digi paper is from the A Loving Heart paper pack. My card is all about the loveliness Spring - the colors, the images, it just makes me sigh. Good Morning! I hope your week is going well. It's going fast for me! I'm not complaining by any means, I'm looking forward to the weekend. I have a date with my daughter on Saturday. Hollyanne turns 14 (ugh!) on Friday so we're going out for her annual birthday beauty day. I treat her to a manicure/pedicure, lunch and a new outfit. We've done this since she was about 7 and it's so special. 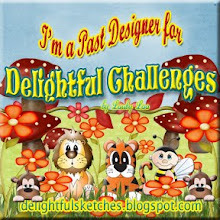 On to Digital Delights Delightful Challenge.... it's a new release. I'm sure you've seen it already in the DD store. This week's challenge is a FANTASY THEME. I wasn't quite sure how to interpret this and I know I didn't do this Dotty stamp the justice it deserves - in fact, I hate my card. But I'm posting it anyway - please feel free to leave me "Melissa you should've done this or that" comments. I know one thing for sure - I bet I've got you singing Somewhere Over the Rainbow. This is Dotty. Be sure to check 'em out. 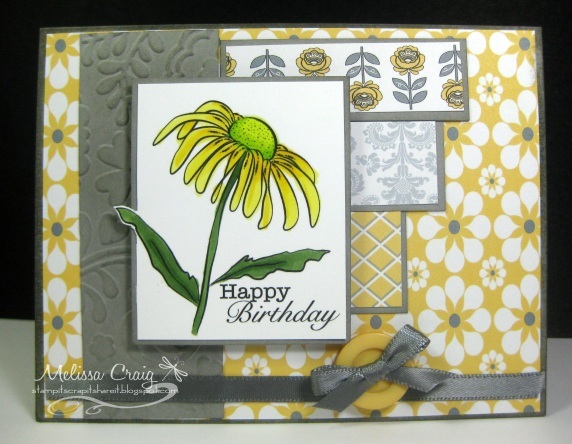 My card is featuring a new set by ARTish called April. I absolutely love my card this week - I hope you do, too. I used a fabulous sketch from The Deconstructed Sketch. The colors are great and I really love the boldness of the black polka dot ribbon. Good Morning! I hope you all had a great weekend. Mine didn't go according to my plans - I really wanted lots of crafting time yesterday and I ended up not getting much done at all. I had some swelling going on in my legs and feet and was just very uncomfortable sitting at my table. Oh well, I have cards to share with you today. So be sure to come back in about an hour to see my other card. Bunnies, Jelly Beans & Chicks. Oh My! I love this little chick - she's just so cute! I also used the sketch from The Sweet Stop.